Browsing in antique shops, you will quickly come across a piece of jewellery labelled ‘suffragette’. Antique jewellery pieces incorporating the gem colours purple, white and green (typically amethyst, pearl and peridot) are nowadays almost exclusively associated with the suffragette movement by jewellery sellers who are understandably keen to attach some romance and meaning to the pieces they sell. But is this brooch/ring/pendant you are looking at really linked to one of the most important political movements of the 20th century, or is the colour combination merely a coincidence? 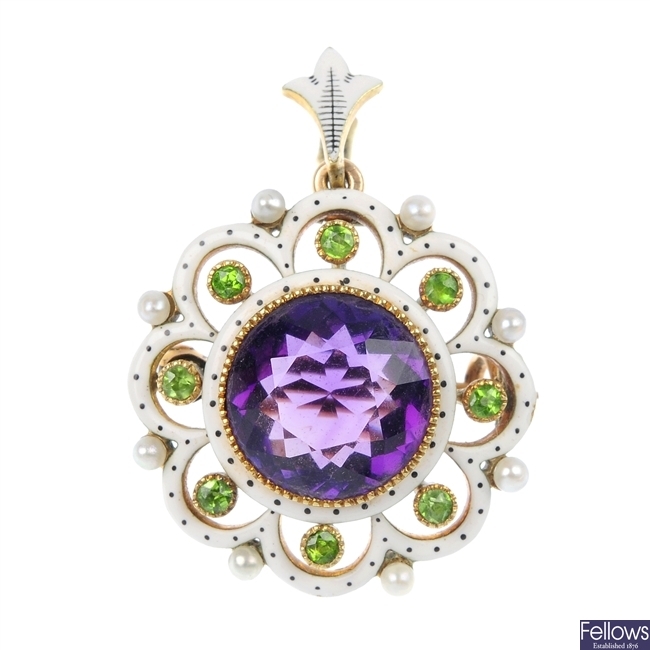 A turn of the 20th century pearl, enamel, diamond, amethyst and peridot gold pendant labelled suffragette. Women had no right to vote at the beginning of the 20th century. It was an unhappy situation and women’s suffrage groups had been around in various forms since the 1860s. In 1903 a new militant organisation called the Women’s Social and Political Union (WSPU) was formed by the Pankhurst family. The motto Deeds Not Words would separate the WSPU from its predecessors, as would its actions of disrupting political meetings, pestering politicians and civil disobedience of all kinds including arson. 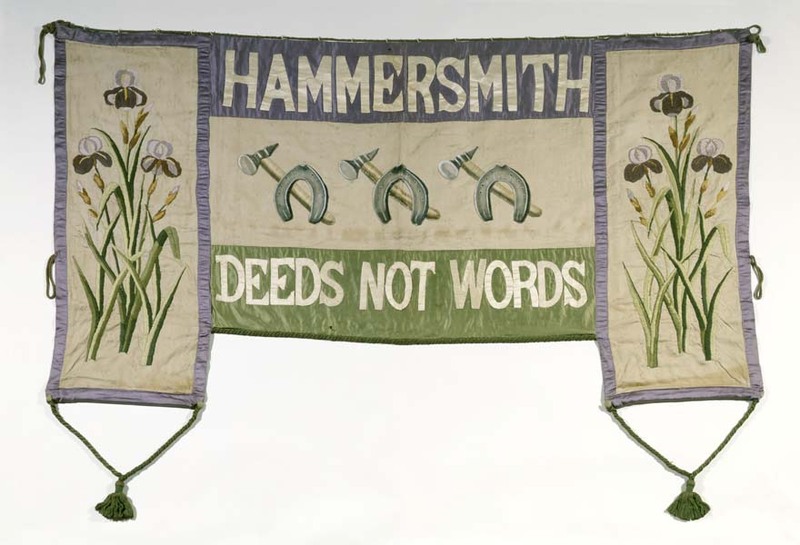 Suffragette banner carried by the Hammersmith branch of the WSPU via Museum of London. These political activists meant business and were named ‘suffragettes’ by the Daily Mail in 1906, a name they would quickly adopt themselves. The fearless women would regularly be incarcerated in Holloway women’s prison, where they would hunger strike and suffer the horrors of forced feeding. The support for their cause was growing and a 1908 demonstration attracted crowds of 30,000 and upwards. 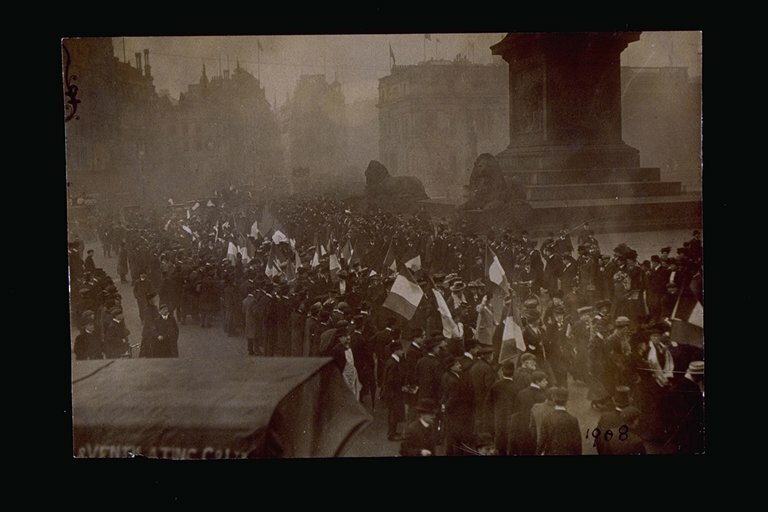 A Suffragette Procession on Trafalgar Square, 1908 via Museum of London. One of the ways activists and ordinary women would show their allegiance to the suffragette cause was through their fashion, jewellery and other adornments. The purple/white/green colour scheme was devised by Mrs Pethick Lawrence who wrote in 1908 in the Votes for Women magazine (a publication which sold 40,000 copies a week at its height): ‘Purple as everyone knows is the royal colour, it stands for the royal blood that flows in the veins of every suffragette, the instinct of freedom and dignity…white stands for purity in private and public life…green is the colour of hope and the emblem of spring. I wish I could impress on every mind as deeply as I feel myself the importance of popularising the colours in every way open to us’. 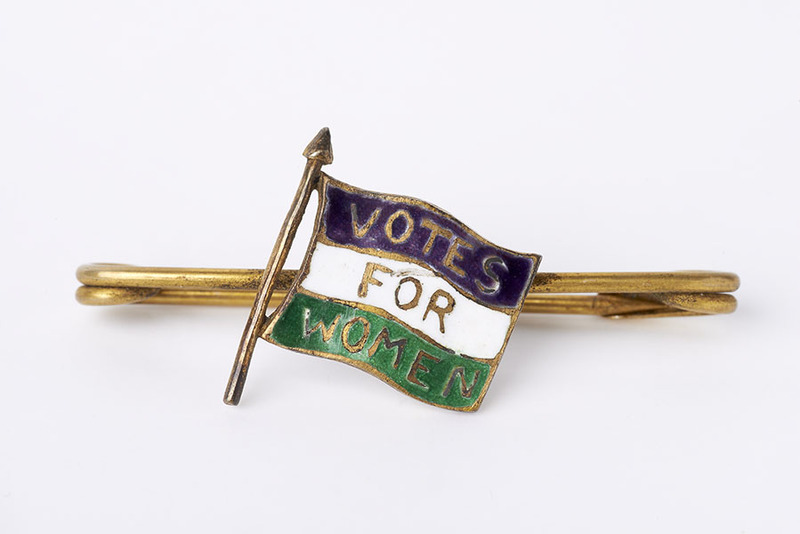 Suffragette bar brooch with purple, white and green enamel flag marked ‘Votes for Women’ via Museum of London. And popularise it they did, which was no mean feat in an age of black and white photography. Within a year of Pethick Lawrence’s statement, a whole host of manufacturers and retailers in fashion and jewellery were incorporating the three colours into their designs. Suffrage themed hats, ties, hosiery, scarves and pins became common place in department stores and shops and their daily wear was encouraged. Jewellery shop windows filled with pieces set with purple, white and green and at the more expensive end of the market, Mappin & Webb devoted a section of their 1908 Christmas catalogue to suffrage jewellery. Suffrage jewellery took many forms from medals and badges, to pieces fashioned cheaply from tin to beautifully decorative silver, gold and gem-set pieces. The three colours evoked a huge response in wearers and onlookers – the latter not always positive – during the period 1908-1914, and the three colour combination was universally linked in Britain during this short period to the suffragette cause. The jewellery produced incorporated amethysts, chalcedonies, demantoid garnets, chrysoprase, moonstones, pearl, glass and enamel. While most was not made specifically for members of the WSPU, it was certainly created and marketed via their publications to exploit their cause, and because of the colour scheme’s notoriety, we can assume that anyone purchasing these pieces did so from a position of support. But some words of caution too, because while support was large and many items of jewellery were created, it is hard to be sure of the provenance of anything without date hallmarks. The period for the creation of this purple, white and green suffrage jewellery was small – between 1908 and 1914. Anything created before or after this date does not have its links in the WSPU suffrage movement, neither is anything produced outside of Britain (with the exception of perhaps some American pieces around 1910). Jewellery with pink stones interpreted as purple and diamonds interpreted as white should be considered carefully too, since the colour scheme was rigid. An amethyst, pearl and peridot ring hallmarked for London 1913 via Laurelle Antique Jewellery. Still, the WSPU colour combination is beautiful and to my mind amethyst, pearl and peridot look fabulous set together, especially in yellow gold. Purchase the jewellery because it’s old and beautiful – it meant something to someone at one time and that is the charm with old pieces. But be cautious of linking it definitively to the suffrage movement (and paying an inflated price as a result) without a strong indication of such, for example a hallmark with date letter and a maker’s mark. An early 20th century 15ct gold amethyst, demantoid garnet, seed pearl and enamel pendant/brooch sold by Fellows in Jan 2013.